At Tymes Square Dental, we provide the best in dental servicing to the whole family. Whether you’re simply coming in for a routine cleaning, or you’re looking for restorative or cosmetic dentistry services, our team of smile experts has the decades of combined experience and state-of-the-art facility to allow our patients to leave our office with the best smile they’re ever had. At our office, the patient experience and preventing serious dental problems are our top priority. That’s why we take the time to educate our patients and place a great deal of importance on routine exams, so that small complications can be treated before they become costly and painful. 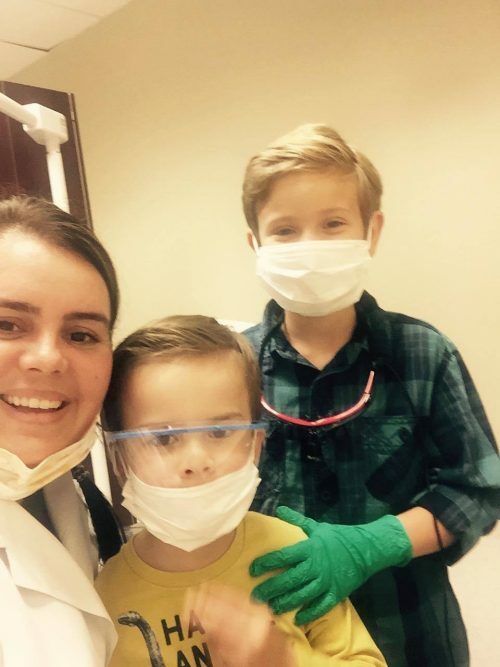 We have extensive experience working with teens and small children, allowing us to make the dental experience best for everyone. If one or more teeth need to be replaced, then a bridge can be used to fill in the space. These dental restorations are designed to be anchored on the surrounding healthy teeth or dental implants. Bridges are an excellent solution to improve the appearance of the smile, restore normal functioning, and reduce the risk of dental complications that occur from missing teeth. Teeth that are chipped, fractured, decayed, or discolored can be treated quickly using a dental bonding treatment. This process involves the application of tooth-colored resign that bonds to the surface of the teeth. This treatment doesn’t require pieces to be manufactured in a laboratory, which means that the treatment can be completed in a single visit. It is a cost-effective, easy way to improve the appearance of your smile with minimal treatments. Dental crowns serve multiple functions, such as improving the appearance and strengthening the structure of a tooth. A crown is designed to cover the outside portion of the tooth. Often, crowns are suggested when a large portion of the tooth was removed due to damage or tooth decay. The crown is custom-fit to your mouth and feels like the natural tooth. Damage to your teeth and gums can take a toll on your appearance and confidence. If you don’t love your smile, then you need to talk to a cosmetic dentist about restorative treatments. Our experienced team will evaluate your dental health and offer recommendations for the best results. Restorative dentistry can include everything from a basic filling to dental implants, crowns, and veneers. Immediate dental care is essential when a dental emergency occurs. Whether you are experiencing a toothache or your mouth has been injured in an accident, our team is just a phone call away. Some of these emergency treatments are time-sensitive, so we encourage you to contact us as soon as possible. We will find a time to fit you in the schedule or meet for after-hours care as required. If you are looking for a long-term solution for tooth replacement, then dental implants are one option that shouldn’t be overlooked. The implant uses a post that is secured in the jawbone, acting as the root of a natural tooth. Often, bridges or crowns are put on top of the post, placed in alignment to create a full and complete smile. There are times when the root of a tooth becomes infected. When the infection is left untreated, it can cause pain, and the infection can spread through your mouth. Often, the best treatment to save the tooth is to have a root canal. The technology for this treatment has come a long way over the years, making a root canal almost as simple as a basic filling. The dentist drills into the tooth to remove the infected tissue, then the inside is sealed and filled in. A crown might be needed to strengthen the structure of the tooth after the root canal is complete. Ongoing dental care is essential to ensure good dental health for life. Not only do you need to visit a dentist for regular exams and preventive treatments, but at-home flossing and brushing are key to maintaining the health of your teeth and gums. When you visit our office, we will provide education and personal recommendations based on your dental health and treatments that might be needed. Our goal is to help you with creating the highest level of oral health and hygiene. This is a focused beam of X-Ray particles through bone which produces an image on special film, showing the structure through which it passed. This gives the familiar black and white images that doctors and dentists use to diagnose problems. X-rays are a necessary part of the diagnostic process, and not to use them could lead to un-diagnosed disease. Without an X-ray of the whole tooth, and supporting bone and gum tissues, there is no real way to detect infection or pathology that requires attention. Amazing staff! Everyone is so wonderful to deal with. I am such a wimp when it comes to the dentist but they make it a wonderful experience and put you at ease. I won’t go anywhere else. They are always looking out for your best interest. I would highly recommend them for the whole family. Great experience! By far the best dentist in this area! Always is straight forward and honest about dental work! If you or child really do not have to have it then she will not do it. My kids love going here. Everyone is always so friendly! Great place to go. I have been going here for years and so have my parents. The staff is friendly and the doctors are very professional. Definitely recommend this place.